Every person in your company has unlimited untapped creative thinking capabilities —more than they themselves might know exist. And the first step in developing these dormant capabilities is to identify where people stand currently in realizing their creative thinking potential. Let's start by making a distinction between thinking and doing, using mind and body, as those modes of working relate to the primary functions of individuals and jobs. We all think and do virtually every waking moment, even when doing is only sitting at a computer or sleeping. Everyone in your organization falls principally into either the thinking mode or doing mode as they provide their greatest single value to the organization. Increasingly in business, companies employ more and more people for their thinking and fewer and fewer for their doing (see the Imagination Age grid on page 16). 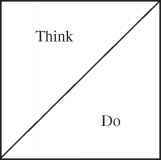 Surprisingly, thinking and doing are two concepts that are often confused when discussing creativity. Imagination, ingenuity, and innovation are, of course, all in the realm of thinking. The execution of the ideas that emerge from creative thinking is mostly in the doing realm — in which we use our eyes, hands, arms, backs, and legs. As we discussed earlier, people often confuse these realms. "I'm not creative. I can't draw a straight line," we often hear. Or, here's another misconception: "Listen to her sing. Isn't she creative?" Not necessarily. Drawing and singing are in the doing realm, where very little creativity occurs. Songwriting, but not singing, is in the thinking realm. Drawing a straight line requires no creativity. It requires talent, maybe skill, but it's not an example of creativity because it's not thinking of something new. As we discussed in Chapter 4 our society has somehow twisted the term creativity to mean "artistic." Most art is the result of talent, "doing," unless it's based on an original idea, in which case it's an expression of creativity, an expression of the original idea that happened in the thinking realm. There are exceptions, such as abstract painting, where the artist "does" usually without preconceptions. Now, all this discussion of the thinking realm forces another distinction: creative thinking versus rational thinking, or new ideas versus old ideas. As Einstein put it, imagination versus knowledge, what might be versus what is. In the same way we need to be clear on the two modes of thinking, we need to distinguish between the two modes of doing: crafting, or doing with care, and laboring, or just knocking it out. Together, these four basic modes of function comprise the spectrum of creative thinking types within which all people function. They also denote the four basic animals that Mind Farmers must cultivate. 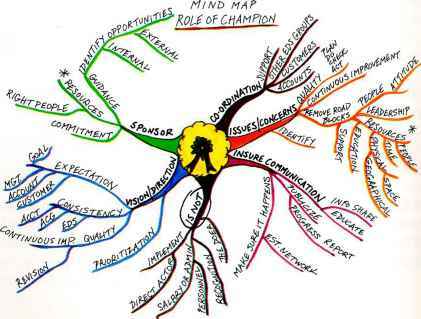 The four basic Mind Farming personality types. 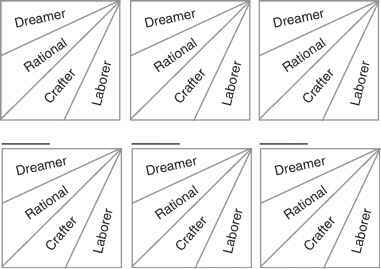 tify the Laborer, the crafter, the rational, and the dreamer. The first two are principally in the doing mode, of course, and the latter two are in the thinking mode. All individuals function in all four fields at different points in time, as they migrate around the map according to what they're doing or the challenges that face them. But all individuals also have a dominant thinking mode and a dominant doing mode, one of which is their superdominant mode, which normally defines that person's primary value to the organization. Sometimes you can be in all four modes over a very short period of time. Let's take the example of painting your living room. When considering unusual paint colors, say periwinkle or puce, or trying to match color on the underside of a rubber plant leaf, you would be in the dreamer mode. When considering colors such as tan or gray, colors that are more common, you would be in the rational mode. When doing the fine work of painting—cutting edges or painting a window sash—you'd be in what i term the crafter mode. But when you're watching something on TV or doing something else that occupies your mind while at the same time painting the walls (barely concentrating on what you're doing), then in terms of Mind Farming you're in the Laborer mode.